The Lakeville Library Trustees and the Lakeville Historical Commission invite the public to attend the dedication of the "Brian H. Reynolds Local History Room" of the Lakeville Public Library in honor of Brian H. Reynolds and in appreciation of his years of dedication to the preservation of Lakeville's history. For many years, Brian has guided both the Lakeville Historical Commission and the Lakeville Historical Society, and he continues to remain a wealth of information regarding Lakeville's history. 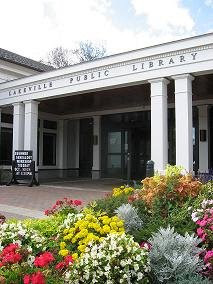 The dedication takes place in the Local History Room of the Lakeville Public Library on Saturday, May 9, from 10:30 to 11:30 a.m. Refreshments will be served. Contact the Lakeville Public Library circulation desk at 508-947-9028 for further details. What a wonderfully rich resource you've created. Kudos! Congratulations to Brian Reynolds! He is an exemplary person and citizen and is well deserving of the dedication of the history room at the library in his honor.